We take as much pride in our cocktails, kitchen, brunch and service as we do in our spirits. Come join Long Road for Happy Hour! We have $3 Mini Martinis and Snacks. Also, enjoy $2 off all cocktails! Join us for a selection of handcrafted cocktails, including the latest in seasonal ingredients and a list of our favorites from along the way. Our drinks, just like our spirits, are crafted from scratch, in house. We make all of our own bitters, simple syrups, tinctures, vermouth, and more, all in an effort to give you a handcrafted experience. We take the same no-shortcuts approach to crafting our food as we do with our award winning spirits. Our team takes pride in partnering with the finest local farmers and producers to bring you an authentic farm-fresh experience. Join us for dinner or snacks – either way, you’ll find something to pair with your favorite Long Road cocktails. Find only the best blend of breakfast and lunch options at Long Road. 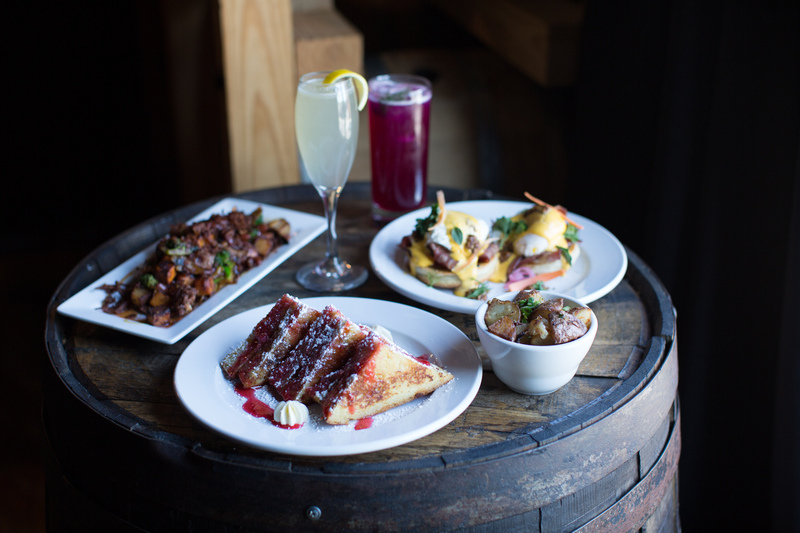 Featuring some of your favorites from our Kitchen Menu to compliment our great breakfast plates. We have sweet, we have savory, we have coffee (and cocktails)! Enjoy your meal paired with a great cup of coffee roasted by the one and only MadCap Coffee. FOLLOW THESE STEP-BY-STEP GUIDES TO USE LONG ROAD SPIRITS IN COCKTAILS AT HOME! CHECK BACK REGULARLY FOR NEW, SEASONAL RECIPES! Add ice and garnish with lime wheel. Add one large ice cube. Shake without ice: whisky, lemon juice simple syrup and egg white. Shake vigorously: Nocino, bourbon, cream, bar syrup, and egg yolk. 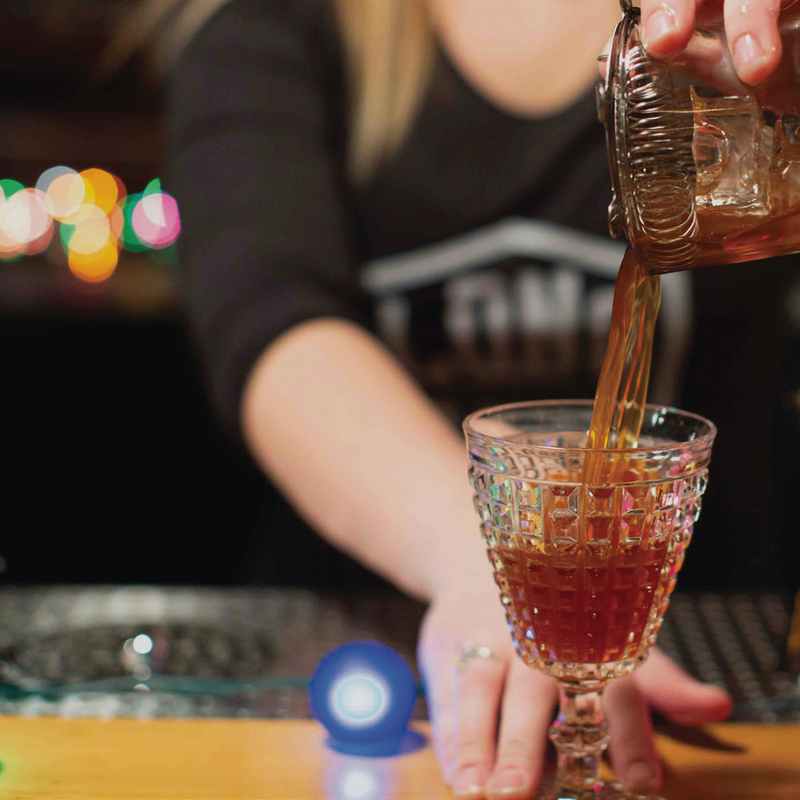 Make it at home: Old Fashioned, featuring Long Road Cherry Liqueur & Corn Whisky! Ingredients needed:Long Road Cherry Liqueur, Long Road Straight Corn Whisky, aromatic bitters. Add 2 oz corn whisky to glass. Add 3/4 cherry liqueur to glass. Make it at home: Whisky Ricky, featuring Long Road Straight Corn Whisky! Ingredients needed: Long Road Vodka Straight Corn Whisky, lime, lime, club soda. Prep garnish by cutting lime into wheel. Squeeze 1/2 lime into glass. Add 1 1/2 oz corn whisky to glass. Stir and top with club soda. Make it at home: Boisterous Corn, featuring Long Road Straight Corn Whisky! Ingredients needed: Long Road Straight Corn Whisky, orange cordial, simple syrup, lemon juice. Add 2 oz Long Road Straight Corn Whisky to shaker tin. Add 1 oz orange cordial to shaker tin. Add 1/2 oz simple syrup to shaker tin. Add 1/2 oz lemon juice to shaker tin. Garnish with cocktail cherry (optional). Make it at home: The Martinez, featuring Long Road Barrel Reserve Gin! Ingredients needed:Long Road Vodka Barrel Reserve Gin, sweet vermouth, Long Road Cheery Liqueur, orange bitters. Prep garnish by peeling orange. Add 1.5 oz Long Road Barrel Reserve Gin to glass. Add 3/4 oz sweet vermouth to shaker glass. Add 1.2 oz Long Road Cherry Liqueur to glass. Add 4 dashes orange bitters to glass. Make it at home: Wendy Aperol Spritz, featuring Long Road Wendy Peppercorn! Ingredients needed: Long Road Wendy Peppercorn Vodka, Aperol, lemon juice (fresh is best), soda water, lemon wheel to garnish. Tools needed: Collins (or other tall) glass, jigger, shaker tins, Hawthorne strainer. Add 1.5 oz Wendy Peppercorn to tin. Add 1 oz Aperol to tin. Add .75 oz lemon juice to tin. Make it at home: Jennifer’s Favorite, featuring Long Road Wendy Peppercorn! Ingredients needed: Long Road Wendy Peppercorn, lemon juice (fresh is best), orange cordial (like Cointreau), simple syrup**, pomegranate juice (like POM)**. **Don’t have simple syrup or pomegranate juice? Just sub in .5 oz grenadine instead. Tools needed: Coupe or fizz glass, jigger, shaker tins, Hawthorne strainer, fine strainer. Add .75 oz orange cordial to tin. Add .5 oz lemon juice to tin. Add ice and shake vigorously until frost begins to develop on outside of tins. Double strain cocktail using Hawthorne strainer and fine strainer into fizz or coupe glass. **Or, substitute .5 oz grenadine. Make it at home: Whisky Smash, featuring Long Road Wheat Whisky! Ingredients needed: Long Road Wheat Whisky, lemon, simple syrup, fresh mint leaves to muddle and garnish. Tools needed: Rocks glass, jigger, bar knife, shaker tins, muddler, Hawthorne strainer, fine strainer. Add 2 lemon wedges (half of a lemon) to shaker tin. Add 6 mint leaves to shaker tin. Add .5 oz simple syrup to shaker tin. Muddle contents until lemons are broken down. Add 2 oz Long Road Wheat Whisky to tin. Shake vigorously until tin begins to develop frost. Strain contents into rocks glass using Hawthorne strainer and fine strainer. Make it at home: Clover Club, featuring Long Road Bartender’s Blend Gin! Ingredients needed: Long Road Bartender’s Blend Gin, lemon juice (fresh is best), simple syrup, pomegranate juice (like POM), egg white. Add 2 oz Long Road Bartender’s Blend Gin to shaker tin. Add one egg white to tin. Add .25 oz simple syrup to tin. Add .25 oz pomegranate juice to tin. Close tins (without ice) and shake vigorously (called a dry shake) for 30+ seconds. Be sure to keep your hands on both ends of the shaker tin as they have a tendency to want to separate during the dry shake as citrus and spirit begin to emulsify egg white. Open tins and add ice. Shake vigorously until frost begins to develop on outside of tins. 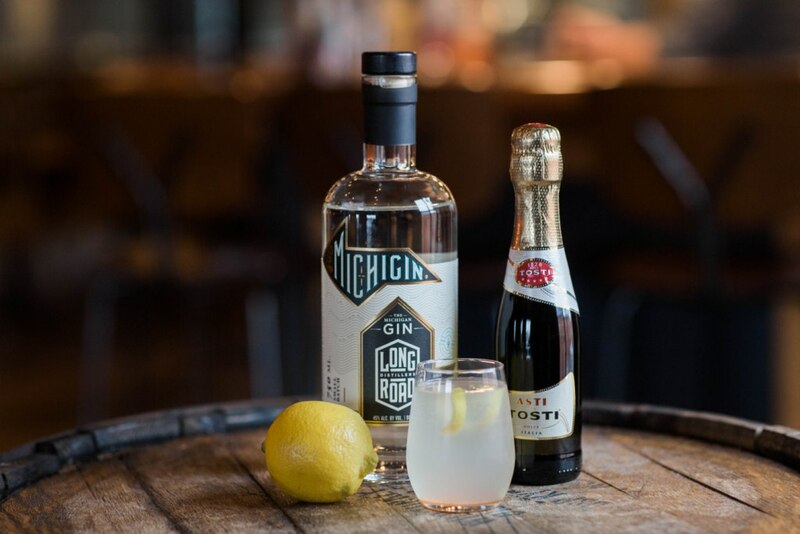 Make it at home: French 75, featuring Long Road MICHIGIN! Ingredients needed: Long Road MICHIGIN, lemon juice (fresh is best), simple syrup, sparkling wine, lemon peel to garnish. Tools needed: Champagne flute (or other cocktail glass), jigger, shaker tins, Hawthorne strainer, fine strainer. Add 1.5 oz MICHIGIN to tin. Add .5 oz simple syrup to tin. Double strain into glass using Hawthorne strainer and fine strainer. Make it at home: MICHIGIN Martinez! Ingredients needed: Long Road MICHIGIN, high quality sweet vermouth (such as Carpano Antica or Dolin Rouge), Maraschino Liqueur (such as Lucardo Maraschino), orange bitters, orange peel to garnish. Tools needed: Mixing glass, jigger, bar spoon, bar knife, julep strainer, martini glass. Prep garnish by cutting small orange zest strip. Add 1.5 oz Long Road MICHIGIN to mixing glass. Add .75 oz sweet vermouth to mixing glass. Add .5 oz Maraschino Liqueur to mixing glass. Add 4 drops orange bitters to mixing glass. Stir evenly until ice begins to melt and settle (approximately 30 seconds). Use julep strainer and pour cocktail into chilled martini glass. Twist orange peel above surface of cocktail to release oils, then drop into cocktail. Make it at home: Old Aquavit Old Fashioned! Ingredients needed: Long Road Old Aquavit, simple syrup, Peychaud’s Aromatic Cocktail Bitters*, Angostura Aromatic Bitters*, orange peel to garnish. *Don’t have both types of bitters on hand? Try 2 dashes of Angostura Bitters instead. Or, experiment with other types/brands of bitters to find the flavor that suits your taste! Tools needed: Rocks glass, jigger, mixing glass, Julep Strainer, Bar Spoon. Add 2 oz Old Aquavit to mixing glass. Add .5 oz simple syrup to mixing glass. Add ice and stir evenly until ice begins to melt and settle into glass. Strain into glass over ice using Julep strainer. Make it at home: Aquavit Gimlet, featuring Long Road Aquavit! Ingredients needed: Long Road Aquavit, lime juice (fresh is best), simple syrup, lime wheel to garnish. Prep garnish by cutting fresh lime wheels. Add 2 oz Long Road Aquavit to shaker tin. Add 1 oz lime juice to tin. Add 1 oz simple syrup to tin. Shake vigorously until tins develop frost on outside. Strain cocktail into rocks glass using Hawthorne and fine mesh strainer. Make it at home: Adult Lemonade, featuring Long Road Vodka! Ingredients needed: Long Road Original Vodka, Lemon juice (fresh is best), simple syrup, rose water (if available), lemon wheel to garnish. Tools needed: Shaker tins, jigger, Hawthorne and Fine Strainers, Collins Glass. Add 1.5 oz Long Road Original Vodka to tin. Add 1 oz fresh lemon juice to tin. Add a few drops of rose water to tin. Use Hawthorne and fine strainer to double strain cocktail into the glass. Make it at home: Moscow Mule, featuring Long Road Vodka! Ingredients needed: Long Road Vodka, lime juice (fresh is best), high-quality ginger beer (such as Fever Tree, assuming we don’t have any of our house-made ginger beer available to-go), and a lime wheel to garnish. Tools needed: Tin or copper mug (rocks glass will do just fine, too), jigger, shaker tins. Add 2 oz Long Road Vodka to shaker tin. Add .5 oz lime juice to shaker tin. Pour entire contents into tin/copper mug or rocks glass. Top with approximately 5 oz high quality ginger beer. Top with ice to fill mug. Garnish with fresh lime wheel and mint sprig (optional). Make it at home: a Blackberry Bramble, featuring Long Road Gin! Ingredients needed: Long Road Gin, lemon juice, blackberries, simple syrup. Tools needed: Shaker tins, muddler, Hawthorne strainer, fine strainer.